Ten years ago when Aamir Khan was on the lookout for a muscular man for a role in Ghulam, he spotted a youngster, who had come to Film City, with his brother. Aamir learnt that he was new to Mumbai, and was in the city of dreams to pursue a career in acting. The youngster auditioned, and Aamir saw that he could not act. "I advised that boy to get into body building, as acting was not meant for him. He was better suited for that job," recalled Aamir. Four years later, Aamir bumped into the youngster again. This time, he wasn't a struggling actor. Instead, he was responsible for giving Saif Ali Khan his new and improved fit look. 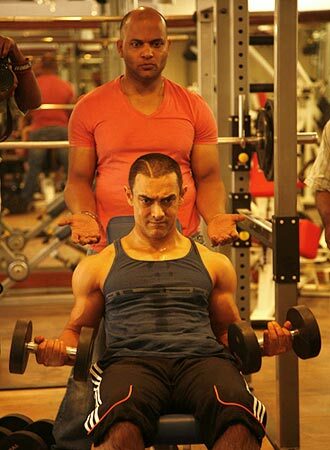 Today, that same youngster -- who goes by the name Satyajit Chourasia -- is responsible for giving Aamir his fab abs in Ghajini.